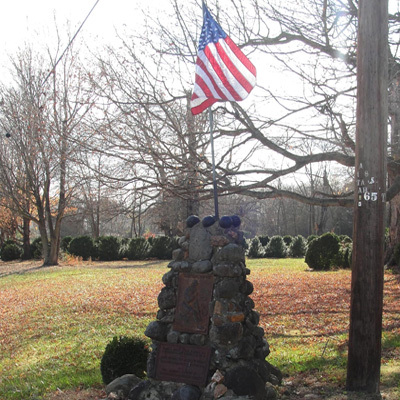 This Boone Trail Highway marker is a 6-feet high stone and masonry pyramid topped with six cannon balls and a tablet showing an image in relief of Daniel Boone and his hunting dog from an 1861 illustration by Alonzo Chapel. A second tablet about Boone and that Generals Cornwallis and Greene passed through on the way to the Battle of Guilford Courthouse appears below. The Boone Highway tablet is a steel Style-2, seen as early as 1919, used through 1926 and distinguished by the BOONE TRAIL HIGHWAY caption being in block letters. The six cannon balls placed in 1921 were reported to have come from Ft. Fisher, but a 1985 photo shows the original cannon balls were missing. At some point, the cannon balls were replaced. Bottom tablet: DANIEL BOONE LIVED 2 MILES S.E. / HIS PARENTS ARE BURIED 8 MILES S.
HERE PASSED THE ARMIES OF GREENE / AND CORNWALLIS TO GUILFORD C.H. The marker was formally accepted after a social with games and “refreshing lemonade and delicious cakes served” by the Village Improvement Society. J. Hampton Rich made the presentation speech. Others who spoke were B.C. Brock, J. Frank Johnson and C.A. Hartman. The marker is located in Farmington, NC at the intersection of NC 801 and Farmington Road. The memorial marker stands near Farmington Road with mature shady trees behind it.